What is the achievement gap? The “achievement gap” in education can be defined as a “disparity in academic performance” between groups of students. Students are typically separated into such groups based on their racial identities or socioeconomic statuses. The achievement gap can manifest in many different areas of student assessment, including, but not limited to, grades, standardized-test scores, course selection, dropout rates, college-acceptance and completion rates (Ansell, 2011). Most recently, the term “achievement gap” has often been used to describe disparities in academic achievement of African American and Hispanic students, who tend to perform more poorly than their white peers. A similar difference in academic performance can be seen in students coming from low-income versus high-income families (Shelton, 2015). Note: This website focuses on grassroots organizing aiming to counteract the racial achievement gap and its effects on African American students in Chicago, Illinois. Socioeconomic achievement gaps are also prevalent across the U.S., and often overlap with disparities noted in African American and Hispanic student performance in relation to the performances of their white peers. For literature exploring contributing factors to the racial achievement gap, click here. Click below for Kandace Sumner’s take on how America’s public schools are perpetuating a cycle of education inequality. In 2015, Rev. James Meeks, head of the Illinois State Board of Education, remarked that the state has a lot of progress to make in terms of minority and low-income students performance. In 2013 and 2014, 67% of white elementary students met or exceeded Illinois state standards, while only 43% of Hispanic kids and 36% of African Americans reached the same level as their white peers (Esposito, 2015). Image 1. Difference in achievement for white and African American students on the PARCC standardized assessment in Chicago, Illinois. In an article published by WTTW Chicago Public Media, Matt Masterson (2017) asserts that, as of 2017, the achievement gap currently exists at 26 points between black and white students in Illinois. For students in Chicago Public Schools, the achievement gap is 37 points. The graphic above demonstrates the difference in overall scores by white and African American students in Chicago on the PARCC, a standardized test which stands for Partnership for Assessment of Readiness for College and Careers. There is a clear disparity between the scores of white and African American students, appearing from 2015-2017 (Masterson, 2017). Masterson (2017) also cites research released by the Chicago Urban League, stating that minority students in Illinois are just as likely to attend a racially segregated school today as they “would have been 60 years ago.” This discrepancy further contributes to disparities in achievement level, with minority students often attending underfunded schools (p. 1). What’s happening across the U.S.? Racial achievement gaps exist in nearly every community nationwide with a “measurable black or Hispanic population” (Sparks, 2016, p. 12). Across the United States, the racial achievement gap manifests in multiple areas of student performance, including, but not limited to, grade retention and average SAT scores (Cook, 2015, p. 1). 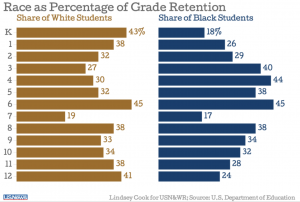 As seen in the graphic above, there is a clear disparity between grade retention of white students and black students in the K-12 school system during the 2011-2012 school year; once formal schooling begins, the prevalence of inequalities remains (Cook, 2015, p. 1). More recently, severe disparities can be noted in the difference in average SAT scores between African American and white students during the 2017 school year. The mean score on the math section of the SAT for all test-takers is 511 out of 800. The average scores for African American students came to 428, while those of white students came to 534, above the national average. Among top scorers (students who scored between a 750 and 800 on the math section) in the academic year of 2016-2017, 60% were Asian, 33% were white, and only 2% were African American (Halikias, 2017, p. 1). What are we doing about it? 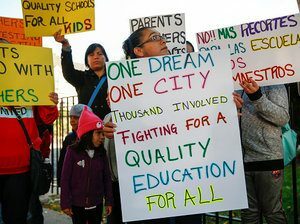 While there is still much progress to be made, many teachers, students, and community members have organized around issues regarding equal educational opportunities for all students, regardless of race. 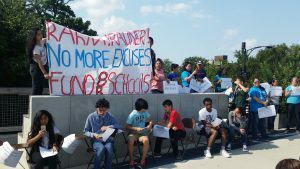 This website explores the efforts of grassroots organizing groups in Chicago, Illinois, combating the racial achievement gap in Chicago’s public and charter schools.